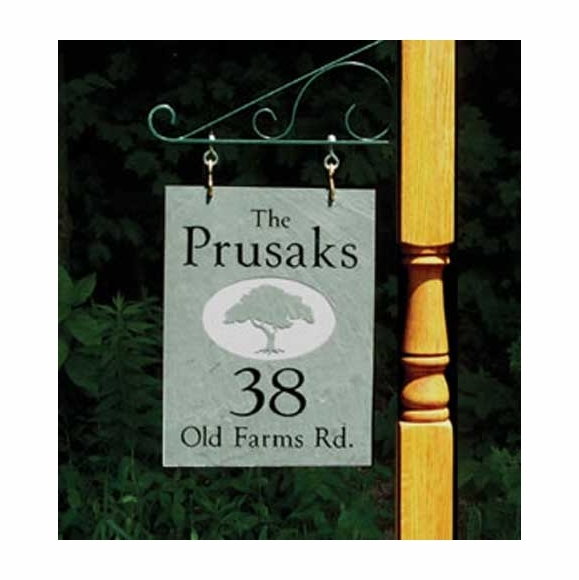 Stone Mill One Sided Hanging Address Sign - - personalized 12" x 16" slate plaque. Custom made for you. Bracket Sold Separately. Designed to hang from a bracket (your own or one of our wrought iron brackets (Comfort House item #: 66616F). Vertical orientation with four lines of text and a central design. Twenty-four design options: cats, dogs, ducks, palm trees, bunch of grapes, golf theme, large animals (horse, deer, bear, moose), nature (leaves, shamrocks, trees), and beach (sail boat, dolphins, seashell). Click small image to see all designs. Line 1 is optional and holds up to three (3) 1" characters. Love the sign! Quick turnaround time from order to delivery. Great product, great price, and everything I expected!